Welcome to Day #6 of Chocolate and Hazelnuts Theme Week. 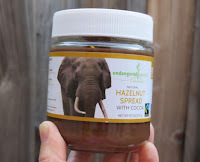 Today's Hazelnut Spread with Cocoa from Endangered Species Chocolate (Indianapolis, IN) had the texture of light, whipped silk; and it was sweet. Sugar and vegetable oil (sunflower, palm) were the first ingredients listed. 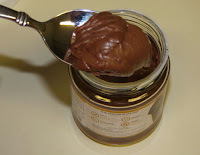 Next, followed hazelnuts and cocoa, in terms of order on the ingredients list and flavor. Both nuts and cocoa were very finely ground to enable the light, silky texture and each helped dial down the sweetness (a good thing if you're eating this a la carte). 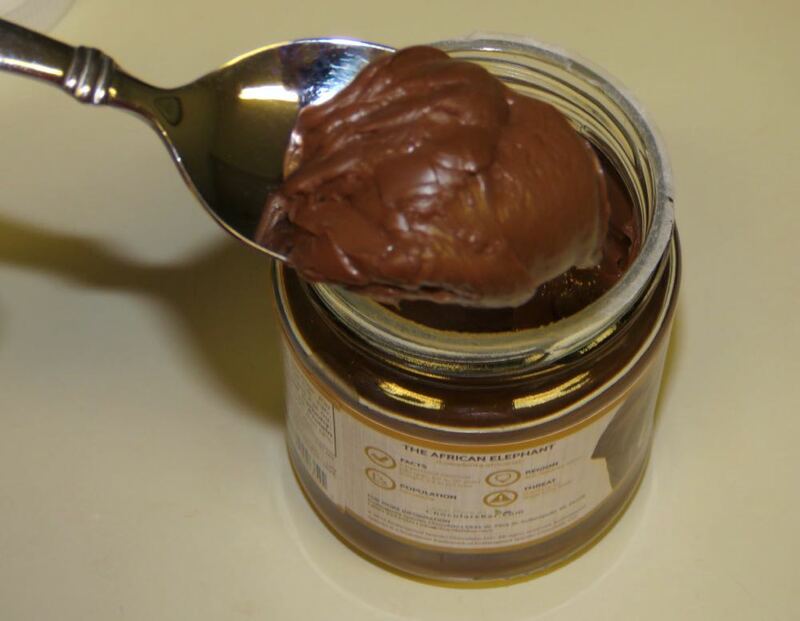 This Hazelnut Spread with Cocoa would be equally at home as a toast or pastry spread, a frosting, a dip for fresh fruit, or a ripple stirred into ice cream. The Certified Gluten Free Spread was made with Non-GMO and Fairtrade cocoa, sugar and vanilla. The label on the glass jar was adorned with an image of an African Elephant. Like other chocolate bar and bark products, Endangered Species features an animal on its products that may need human support to continue to survive. The company donates 10% of net proceeds to partners that engage in wildlife protection and/or conservation-related efforts, such as habitat preservation.